Art by Malavika P. C.
Karadi Rhymes were the first rhymes that our daughter, Anushka was introduced to as a baby. The same applies to our second born, Aditi. Five years of being Karadi fans and they still entertain us. I was even more eager to listen/ look at this audiobook series because two of our friends from B-School worked on it. The protagonist of the series is a mouse. Despite being unwelcome in most homes, mice are often the unlikely heroes in children's fiction. Be it Mickey or Jerry or more recently Ratatouille, mice are often endearing and always victorious. Each episode in this Karadi series, comprises of familiar tales but with a twist introduced into them. In this one, The Thirsty Crow has to be doubly ingenious with the introduction of a mouse fighting for its life, in the pot of water the crow finds. While I would shudder to find anything in my water, this Kaka is accommodating and helpful and the mouse is mighty resourceful and persistent. After various valiant attempts, they succeed and the adventure ends on a happy high. 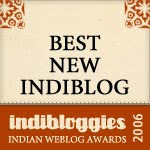 The music is lovely and the narration sounds very Indian- English. Easy to relate to and to follow. The illustrations, the colours are dramatic and very energetic. The crow with its toucan like beak is very expressive indeed. The fonts are engaging, filled with onomatopoeiac words, often adding a sense of drama, making for easy and enjoyable reading. After a couple of times, Anushka wanted to read the book herself, rather than with the CD! 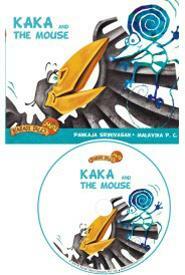 The others tales in the series include The lion and the mouse, Bablu and the mouse , Kutty and the......yes, you got it! i dont think one can enough of em, Karadi tales! Thanks for this Art, sounds good! Art, the cover looks very enticing and says 'pick me up'. Lovely Art! We are big fans of Karadi stories/rhymes. Will pick up this one too. karadi rhymes are irresistible. will check this one out! thanks! Oh, after the success of Lizard's Tail and Little Vinayak, not to mention Karadi Rhymes 1 and 2 in our household, with Lizard's Tail a firm favorite even after a hundred reads/listens over this Summer, I can't wait to check these out! Thanks artnavy! There are so many mouse books on ST itself.I was just observing the related links pics. But each one is unique and special. Yeah- all of u shld check it out- the lion one was not available but the illustartions (on the link in this post)are fantabulous!! The illustrations have such character and humour! Thanks for sharing this one in the I Can Read Carnival.